Your bottom line will thank One Print Solutions. We will work with you to reduce your total cost of printing. Since we work with your existing fleet of printers, no capital investment is required. You only pay for the prints you use. And, consolidating vendors also reduces the cost of processing invoices for multiple vendors. You cannot manage what you cannot measure. 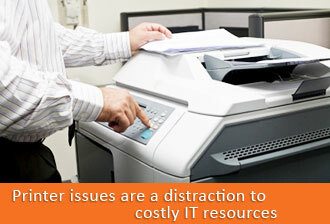 With One Print Solutions you get real time visibility of your entire printer fleet. Actual usage costs can be determined. Problem areas can be quickly identified and taken care of. Your IT department will love One Print Solutions. Instead of being distracted with printing service problems, costly IT professionals can stay focused on their key projects. By reducing the number of calls into your help desk, not only will you reduce wait times, you will also empower your help desk to provide better support. Your end users will appreciate One Print Solutions. Proactive restocking of supplies means that they will never have to remember to order cartridges. Help desk support and on-site service means printers are up and running allowing business to flow smoothly. Optimizing your print infrastructure will also ensure that end users have access to the print capabilities that they require. Contact us today to learn more about how you could benefit from One Print Solutions.